I was lucky enough this summer to get to return to the Collections Conservation Branch to work with Brigid Sullivan Lopez, Carol Warner and Margaret Breuker; whom I had interned with before entering grad school. The lab works on objects from National Park sites throughout the Northeast Region. Objects I worked on this summer were from diverse sites such as: Salem Maritime, Salem, MA; Vanderbilt Mansion, Hyde Park, NY; and Weir Farm, Branchville, CT. 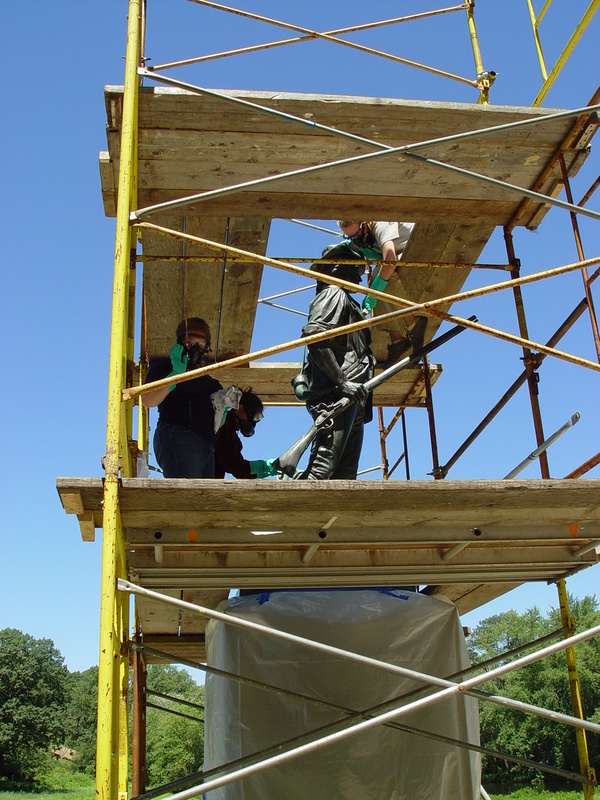 The lab also does projects at different parks including surveys of objects, and treatment of large objects such as bronze statues. 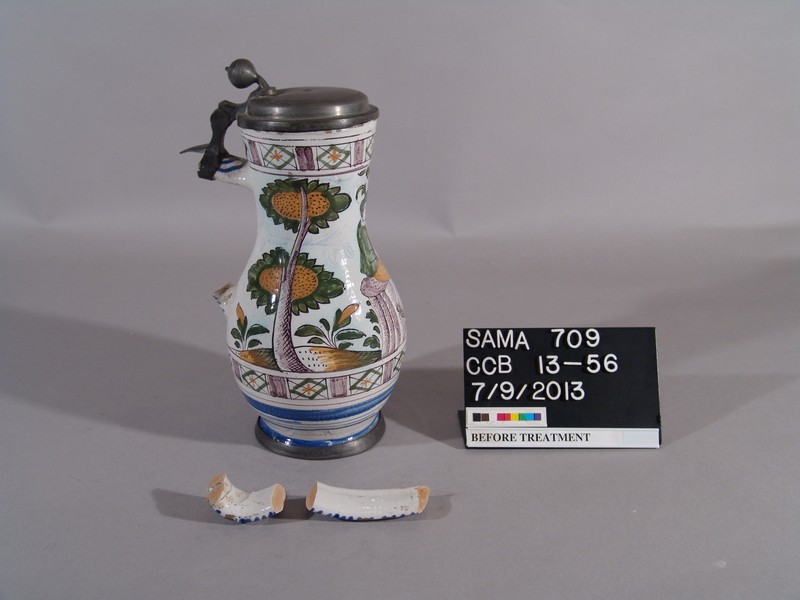 This tankard was found at Salem Maritime, which is a site particularly rich in archeological finds. The city of Salem was a busy port city long ago, and the remains of its wealth and industry are frequently found. This came to us with an old repair to the handle, and a new break most likely formed when the first repair failed. Examined under UV light, cellulose nitrate adhesive was visible around two of the break edges, but not the third. Cellulose nitrate is an adhesive that is easily removed with a little bit of acetone, lucky as this was widely used by conservators for many years. 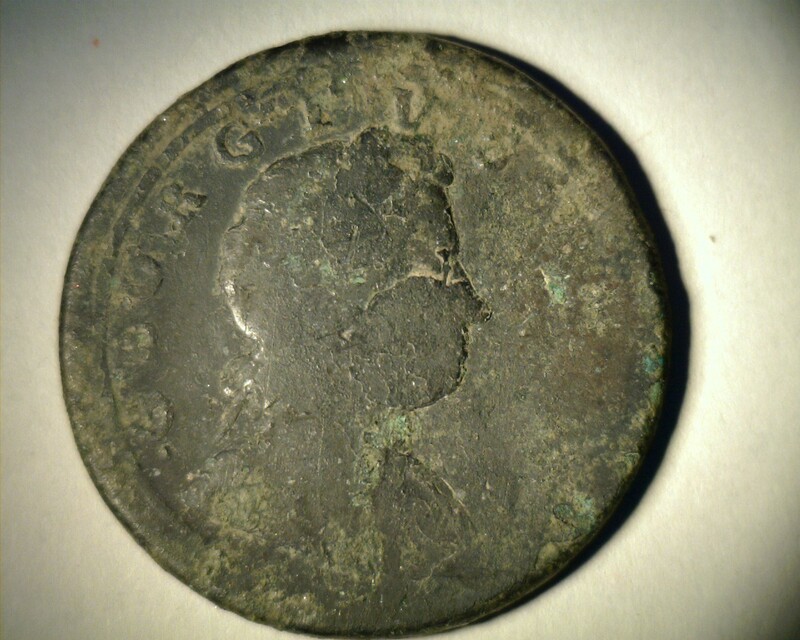 A good clean and a simple wax was all most of the coins (six total from Salem Maritime) needed. 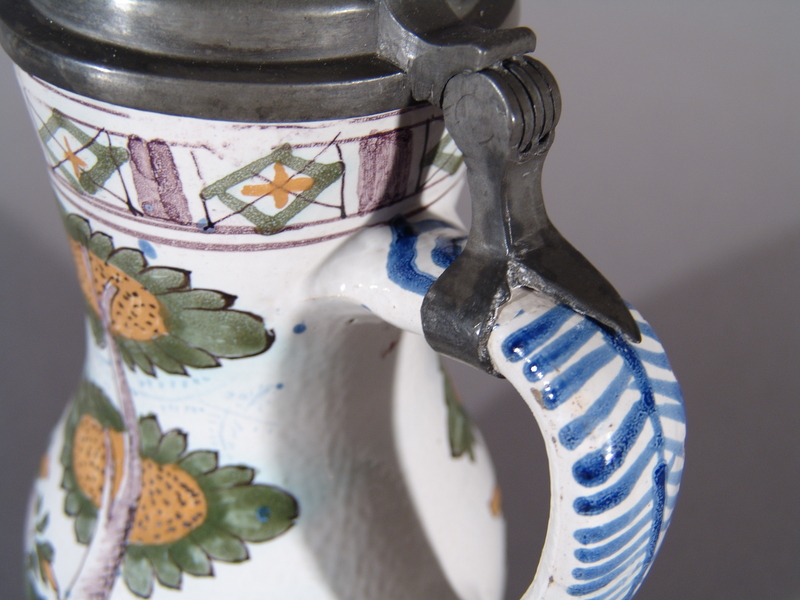 There were no old coatings on them which made cleaning them a lot easier! These are used for interpretation with visitors, so a double coating of a micro-crystalline wax ensures a good protective surface. 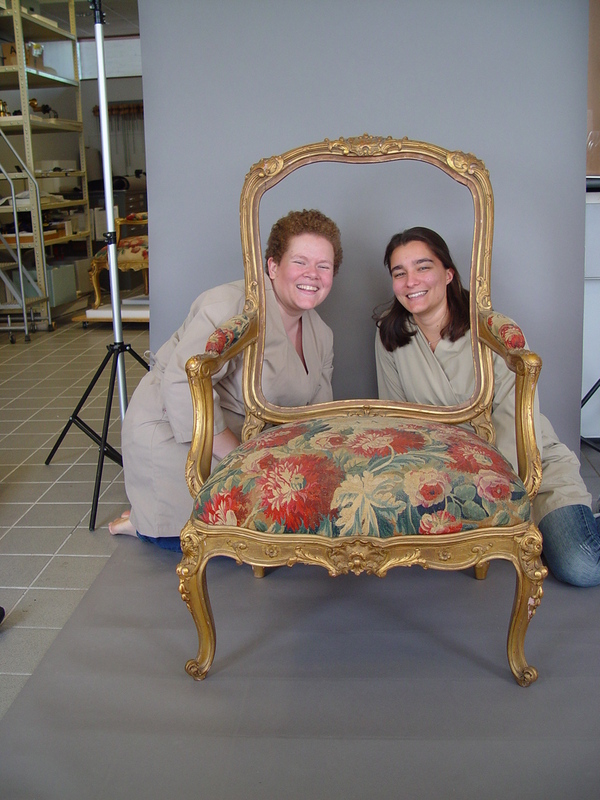 The majority of my time this summer was spent working on a gilt chair from Vanderbilt Mansion in Hyde Park, NY. During the course of its life the gilding had worn in places, exposing the red bole and white plaster beneath. To fix this worn appearance the chairs were painted, all the woodwork top to bottom, with bronze paint. This when new looks bright and shiny, and very similar to gold. 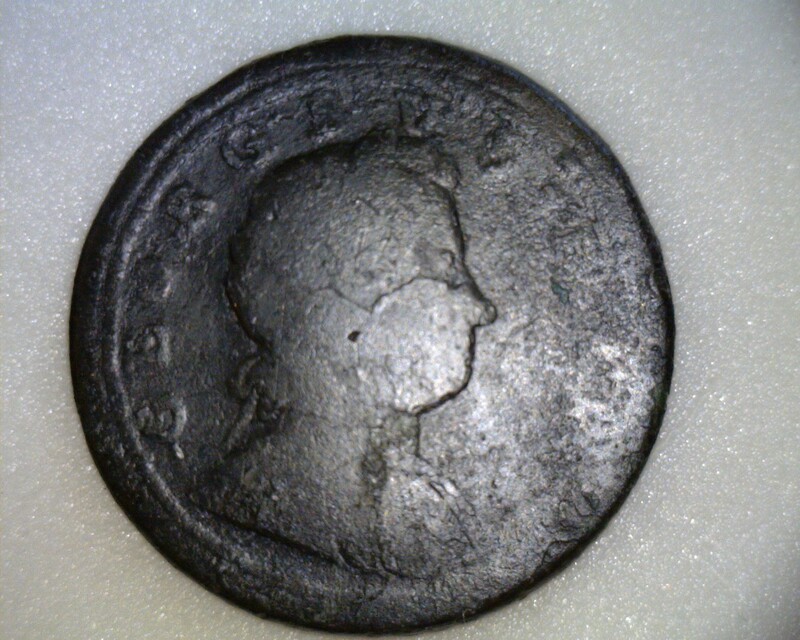 However as it ages the bronze oxidizes and starts to turn a darker, more brown color. Six chairs total came in, and the other intern, Madeline Corona, and I each took one. Documenting the objects is one of the first steps, and Madeline and I took around 500 photos between the two of us of our two chairs. We had a little fun too! Unfortunately bronze paint is very hard to remove. It was evident to from areas where the base plaster had chipped off the chair that it was fragile in at least some places, and maybe all over. The bronze paint we found could be removed by using 5f5 paint stripper cleared with acetone, we made sure while using this to have the fume hood running, and used fans to better ventilate the lab. To protect the tapestry areas of the chair Madeline and I spent a morning making them look absolutely glam with a protective aluminum foil cover. 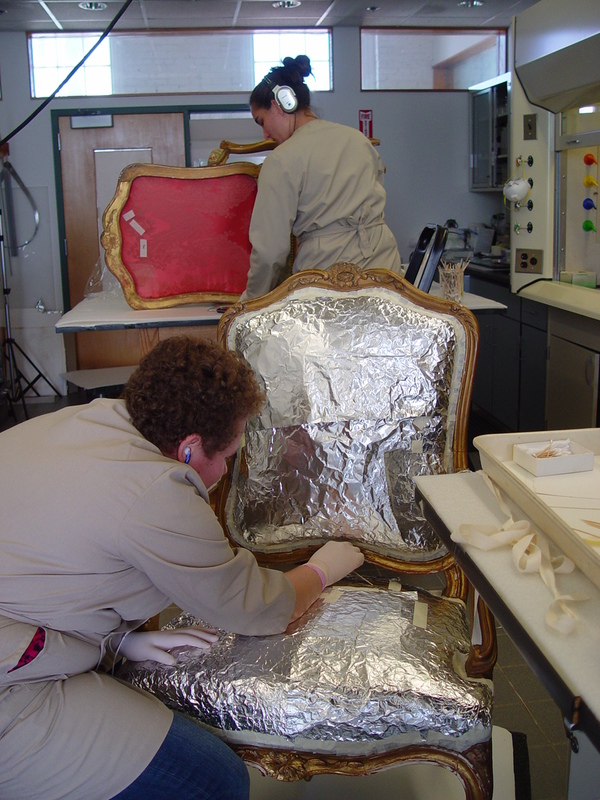 The fabric is attached to the chair with brass tacks and we were able to tape onto these without damaging the fabric, or chair, or impeding removal of the paint. After that we set to work on the paint! The chairs have highly figured ornament where the legs meet the seat rail, and along the top and bottom of the cushion frames. These areas were the hardest to clear, and we rolled and used many toothpick and regular swabs getting into the nooks and crannies. We found areas on the chair with antiquing and overpaint, these and other particularly resistant areas of bronze paint required multiple passes of 5f5. Worst on my chair, and hopefully only my chair were large areas of white latex paint, where someone had covered large areas of loss before covering that with bronze paint. This paint could only be removed by scrubbing with acetone. By the time we’d cleared all the bronze paint Madeline and I solemnly swore to never, ever use it ourselves! 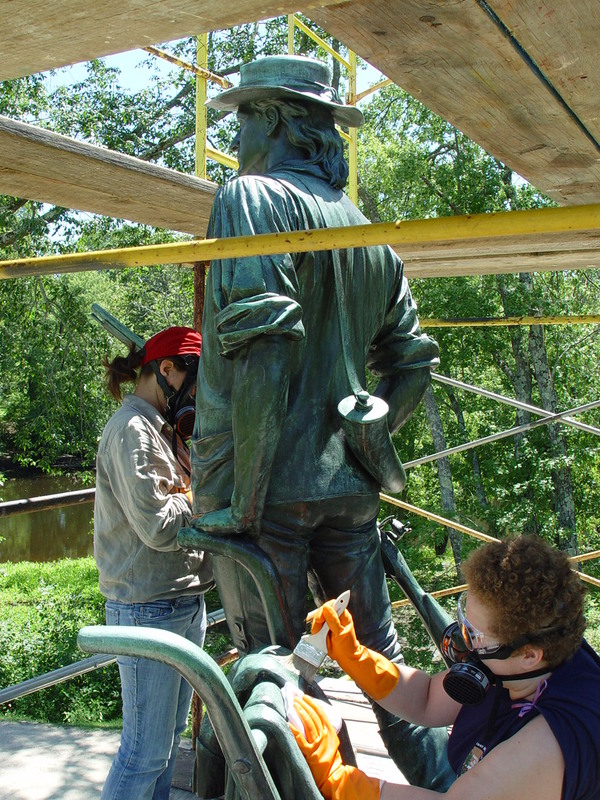 A nice break from all the bronze paint on the chairs was the week we spent working on the Minute Man statue in Concord, MA. 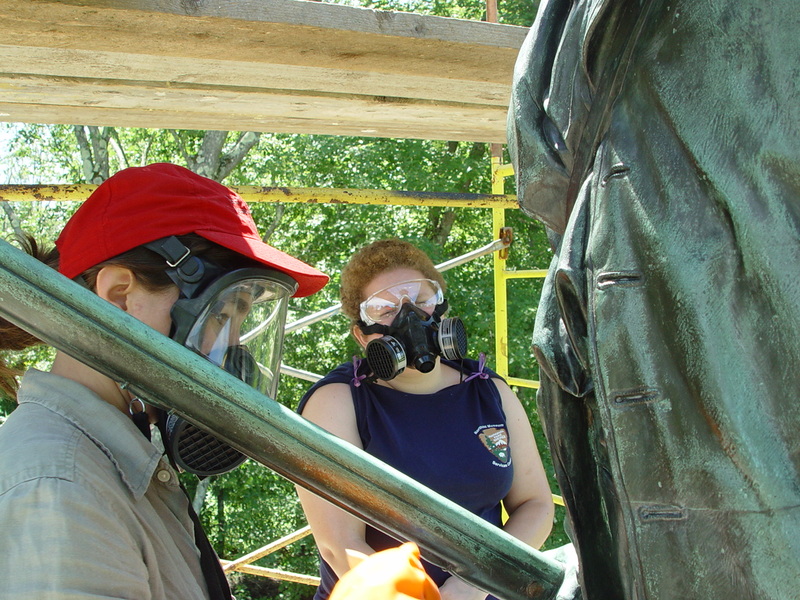 The statue had been previously coated with Incralac, a resing coating, so we got to wear the lovely respirators and orange gloves as we stripped this off in preparation of putting on a hot wax coating. Taking off the Incralac was tough, since a layer of wax was on top of it. While the wax was a naptha based, the Incralac was acetone/toluene based. We ended up doing a two step cleaning process, getting the wax off, then scrubbing off the Incralac. Once the statue was clean, the surface was heated with hand-held propane torches, and wax melted into the surface. After it dries overnight, the whole surface is buffed with soft cloth, we use cloth diapers, which forms the hard protective outer surface of the wax. I had a wonderful summer in Lowell, and all the parks we visited and worked at. Working with the women at the lab is a great opportunity, and I am so thankful to Brigid, Carol and Margaret for all their help and knowledge.